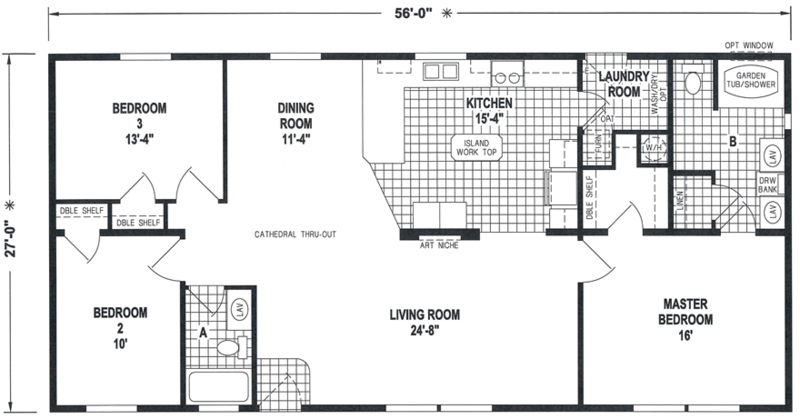 The Kalama model has 3 Beds and 2 Baths. This 1512 square foot Double Wide home is available for delivery in Oregon, Washington, Northern California, Northern Idaho. They say the family that plays together stays together and this model was designed with that sentiment in mind. The huge living room works in concert with the wide open kitchen to make this a very family-oriented house, perfect for socializing and entertaining. Because it’s part of the West Ridge series, this doublewide is exalted by these superb features: front entry dormer, art niche, wood cornice windows, hardwood cabinets. Ask your housing consultant about the other great features that come standard on the Kalama manufactured home.